A new Pew Research Center report examines global public opinion on the challenges posed by aging populations and analyzes projections for the populations in the U.S. and in 22 other countries. 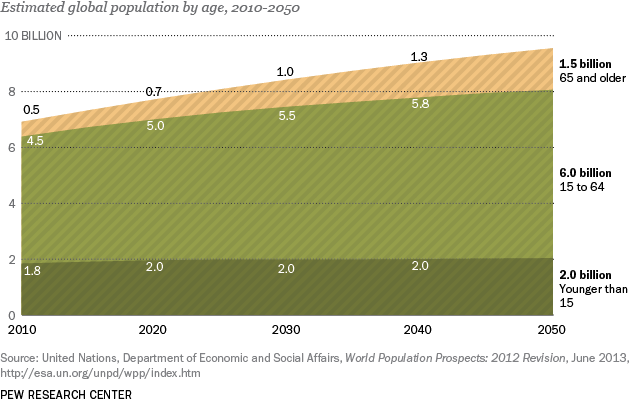 Here are 10 major findings regarding the demographic future of the world’s population in 2050. 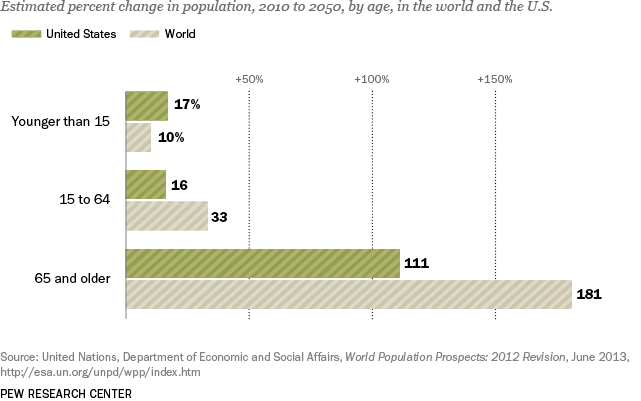 1The global population is getting older: The number of people 65 and older is projected to triple by mid-century, from 531 million in 2010 to 1.5 billion in 2050. In the U.S., the population of seniors is expected to slightly more than double, from 41 to 86 million. 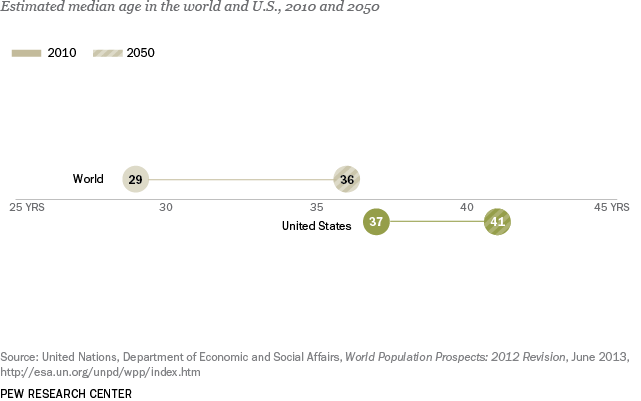 2The world is graying faster than the U.S.: The global median age, eight years less than in the U.S. in 2010, is projected to be only five years less by 2050. 3Who will be among the oldest? 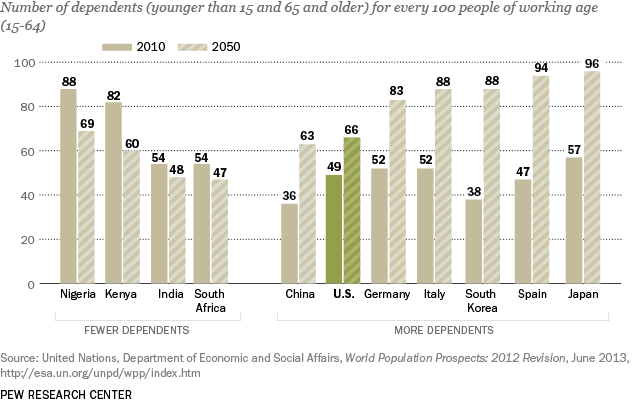 By 2050, the majority of people in Japan, South Korea and Germany are expected to be older than 50. 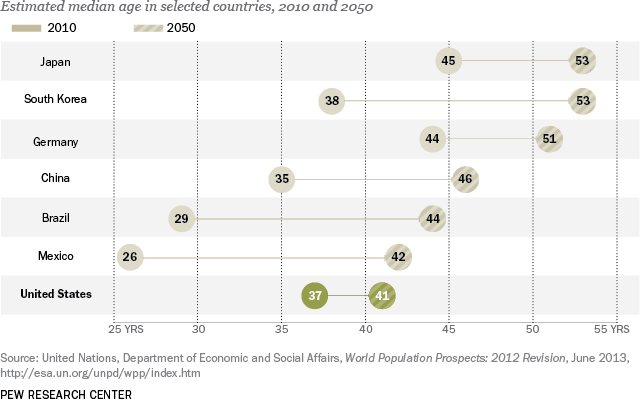 Some Latin American countries, which are now younger than the U.S., will likely be older than the U.S. by 2050. 4Trading young for old: Most countries, including the U.S., are projected to see the share of their population that is 65 and older surpass the share that is younger than 15 by mid-century. 5Pressure on workers: As populations age, working-age people in the developed world may have to support more dependents, while workers in India and several major African nations will likely have to support fewer dependents. 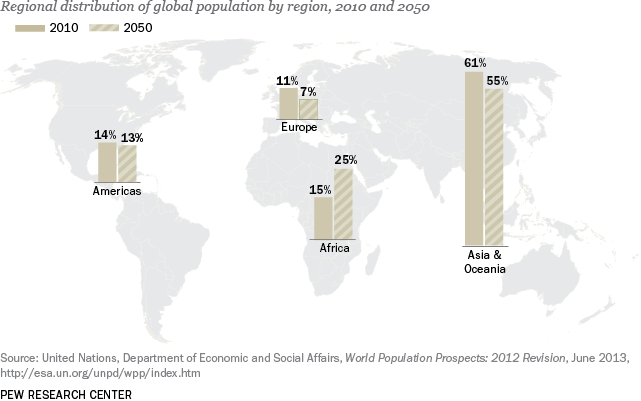 6Population 2050: The global population is expected to increase by 38%, from 6.9 billion in 2010 to 9.6 billion in 2050. 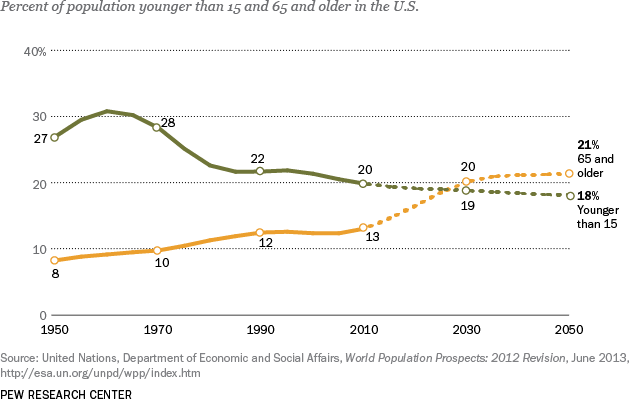 The population of children younger than 15 is projected to increase by only 10%, a consequence of falling birth rates. 7How big will the U.S. be? 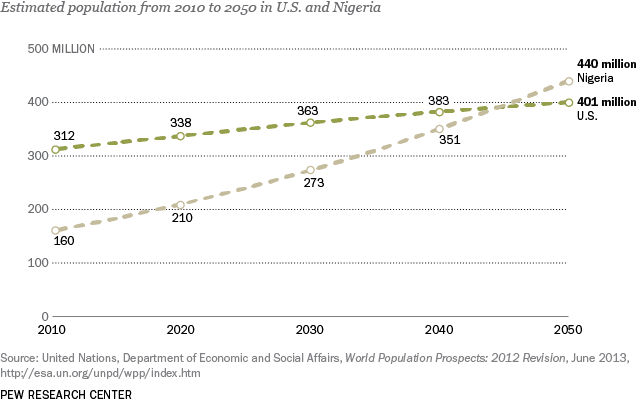 The U.S. population is projected to grow by 89 million residents from 2010 to 2050. The U.S. is likely to grow faster than European and East Asian countries, but slower than Nigeria, which is expected to replace the U.S. as the world’s third most populous country. 8A population shift to Africa: Africa’s population is projected to increase the most and make up a greater share of the global population by 2050. The shares of Europe and Asia in the global population are expected to decrease, while the Americas will hold steady. 9India replaces China as the world’s most populous country: India’s population is expected to increase by 400 million by 2050. 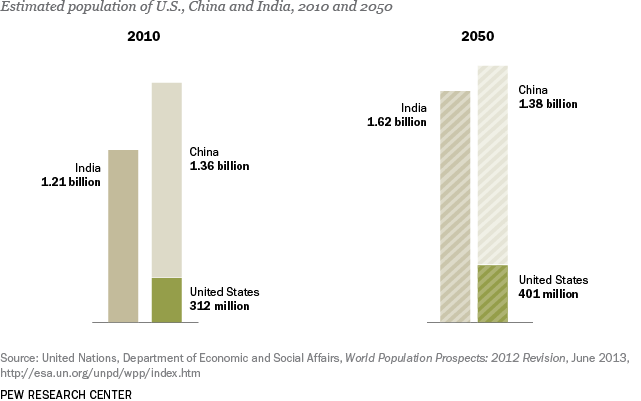 Its projected population of 1.6 billion will be almost equal to the populations of the U.S. and China combined. China is projected to add only 25 million residents. 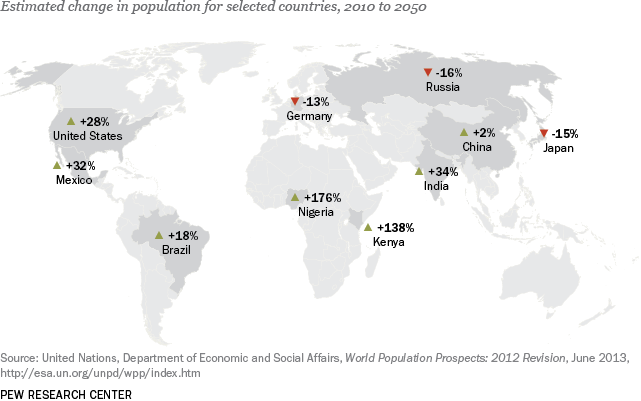 10Population losers: The populations of Japan, Russia and Germany are expected to decrease by more than 10% by 2050. For Japan, this means a loss of 19 million residents; for Russia, 23 million; and for Germany, 10 million.